Cheng Ho is a traditional Phinisi Buginese Schooner built using Ulin wood. 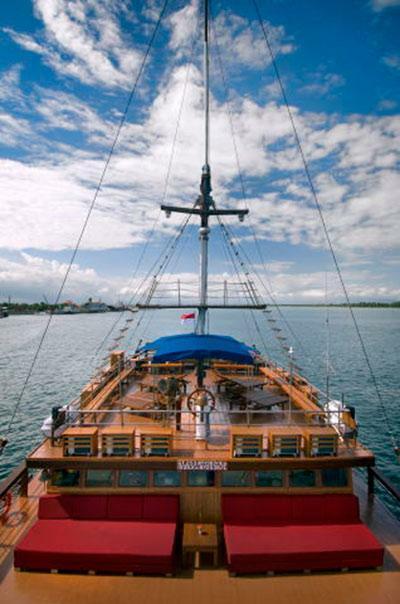 At 33m in length and nearly 11m wide, this is a large boat, which enables it to sail smoothly and safely through the seas in southern Indonesia. 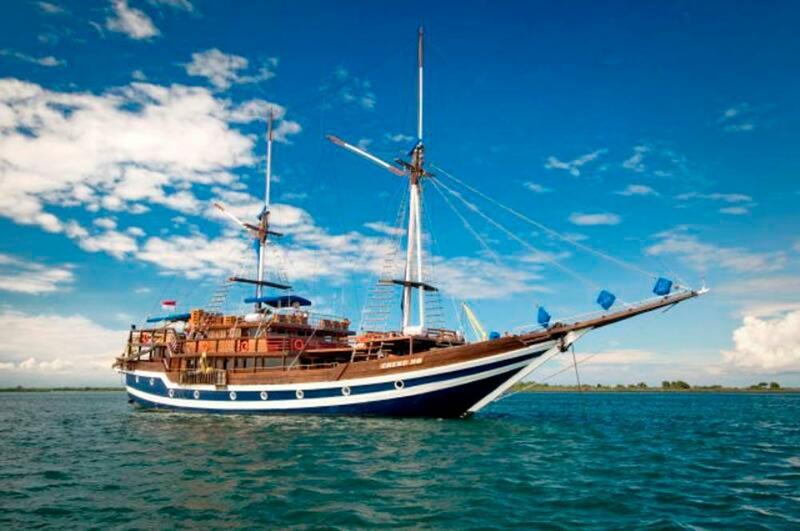 It is extremely popular for divers from all around the world who want to come to the Komodo Islands to enjoy relaxing times on board and exiting dives and land excursions. Most of Cheng Ho’s trips are 6D/5N cruises around Komodo, but there are a few excursions to more remote and exotic areas, such as Alor & Maumere, in addition to one or two slightly longer Komodo trips (7D/6N). 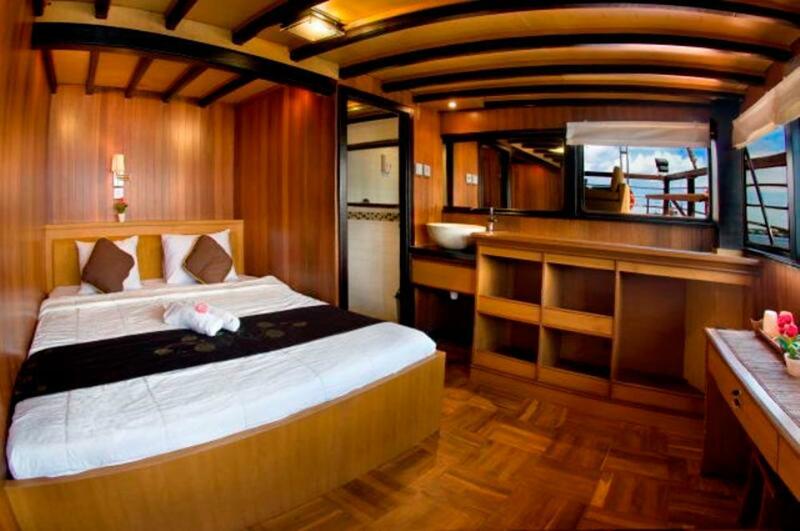 There are 14 cabins on Cheng Ho, and all are air conditioned and have en suite bathrooms with hot & cold fresh-water showers and wash basins. 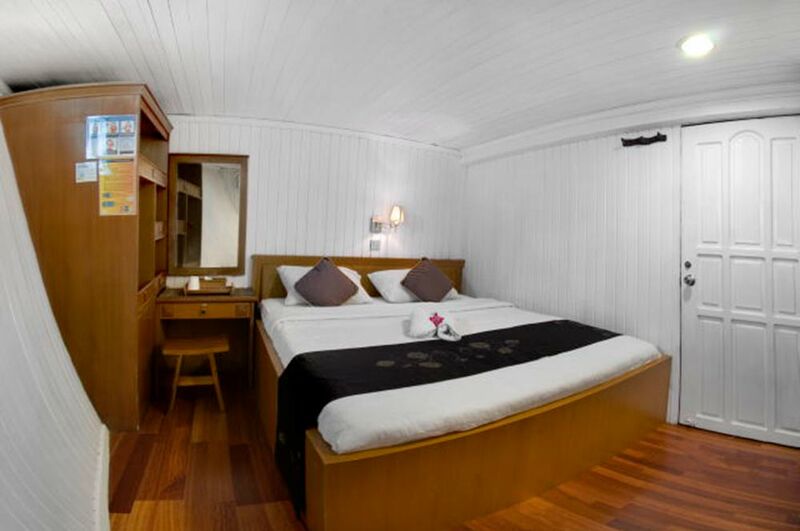 The choice of cabins suits every taste and need, with doubles, twins and single rooms. 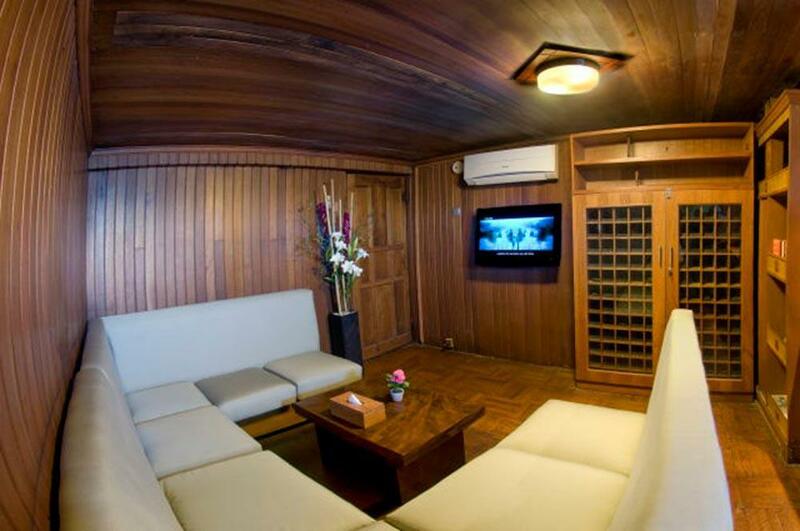 In addition to the wonderful cabins, guests can enjoy air-conditioned comfort in the huge saloon/lounge, which has large comfortable sofas and a dining area, as well as audio/video entertainment. 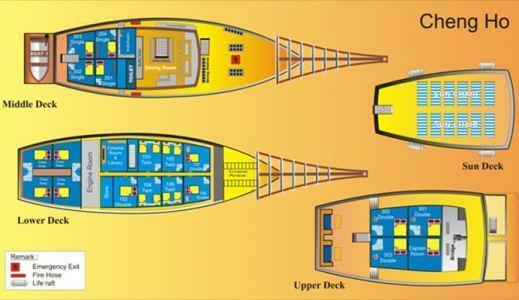 And, for those who want to really focus on a diving video or Hollywood movie, there’s a special theatre room on the lower deck. 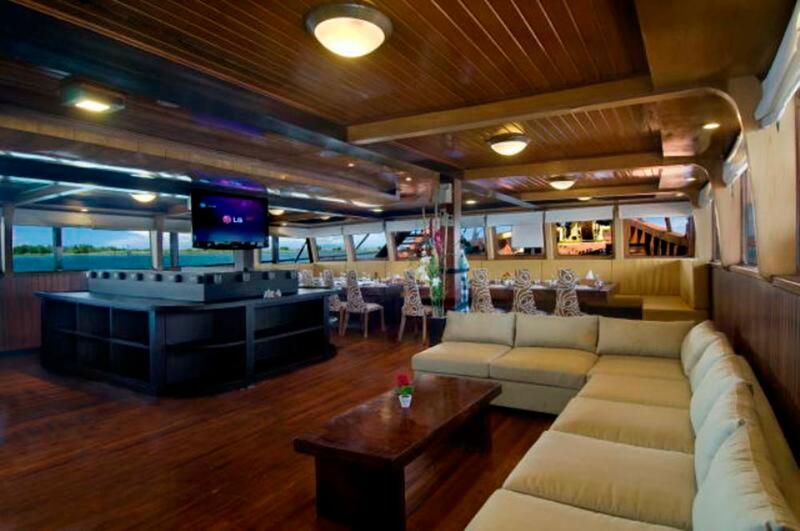 However, most guests who come to this part of the world to enjoy a diving cruise on a yacht such as Cheng Ho want to enjoy the sun and sea breeze, or gaze at star-filled skies in the night. 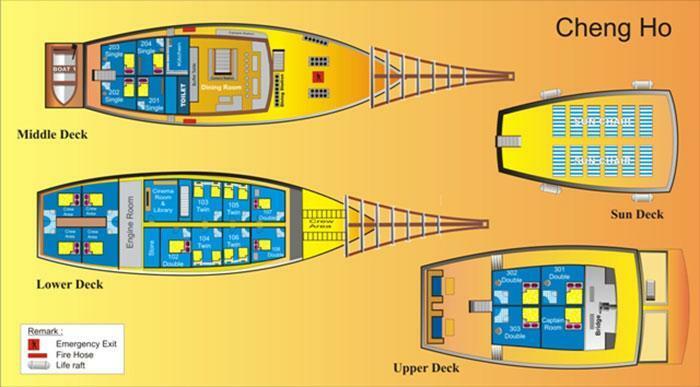 Out on deck, guests can relax on sun loungers and sofas to socialize in groups or find some privacy. For loners who stay awake in the sea breeze, reading novels and looking out for dolphins are commonly enjoyed on the decks of Cheng Ho. Cheng Ho is able to accommodate up to 24 diving guests, but most trips are limited to less than that, making sure that everyone has plenty of space, privacy and lots to eat. The food on the boat is simply delicious. 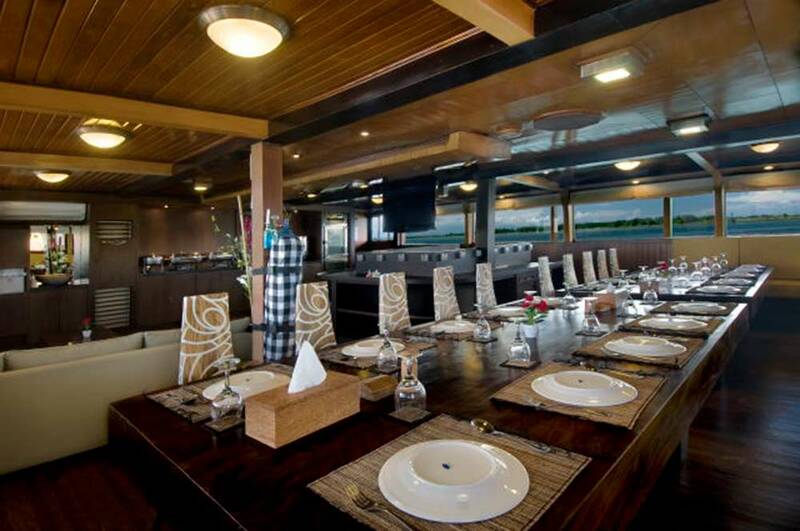 The experienced chefs offer a mixture of local (Indonesian & Thai) and western cuisine, served buffet-style. Between meals there are fruits and snacks available for all. Trips are often full many months in advance, so booking early is important. Nearly all Cheng Ho trips start and finish in Labuan Bajo, which is in Flores (East Nusa Tenggara). Most are 6 days & 5 nights or 7 days & 6 nights. Longer trips spend more time at the best dive sites, or venture a little further from Labuan Bajo. Depending on sea & weather conditions and which flight the final guests arrive on, 1-2 dives are planned for the first day of the trip. Each full diving day there are usually 4 dives at locations to suit the guests' needs & the sea & weather conditions. the final dive of each day is a sunset or night dive. On the final full day there are 2 morning dives, allowing time for guests to fly the next day. This is usually when guests go onto Komodo or Rinca Island to see the Komodo Dragons. On the final day of the cruise, guests disembark after breakfast. Please check the list of Cheng Ho trips below. In November 2017, there are a couple of 'non-Komodo' trips around Maumere & Alor. PLease contact us for detailed itimeraries. Taking part in a diving course enables you to increase your skills & understanding as well as becoming certified to a higher level. 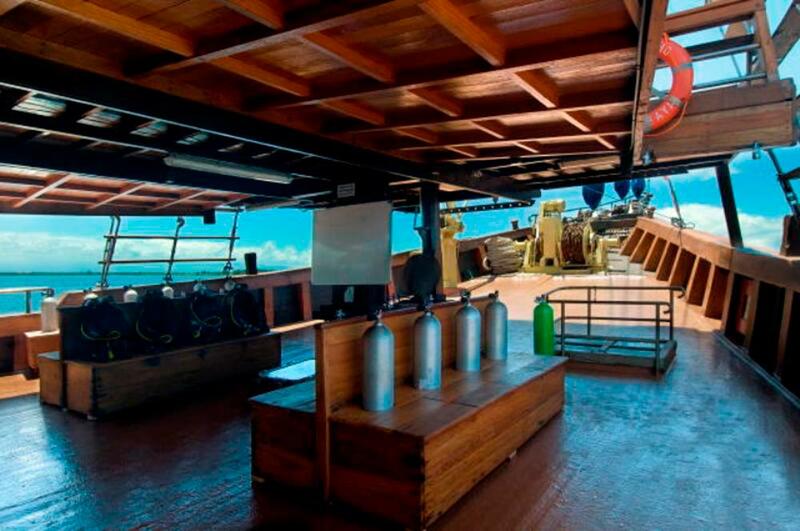 Almost all of the guests who join Cheng Ho liveaboard cruises are certified divers with some experience, and the speciality courses appeal to them. 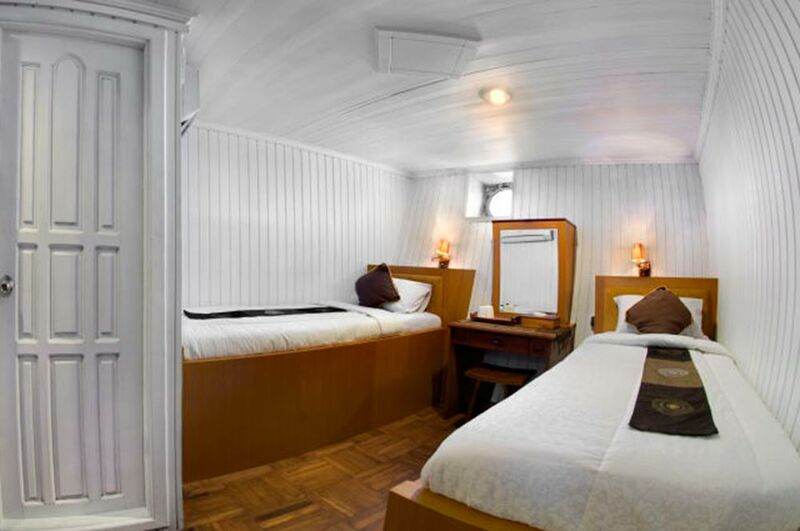 Those divers who are Open Water certified can move up to the Advanced level, and there’s no better time or place to do this than on a liveaboard cruise at the best dives sites of Indonesia, and possibly the world. If you are interested in taking part in a diving course on Cheng Ho, please inform us in good time so that we can advise and arrange everything that is necessary. Cheng Ho guests are normally collected (free of charge) from Labuan Bajo (Komodo) Airport or local hotels on departure day, and returned to the airport or their chosen hotel mid-morning on disembarkation day.